WLK has net cash, putting the company in good position to absorb debt from AXLL, which itself deleverages without handcuffing its acquirer. While WLK’s stock reacted very negatively to the Q4 earnings news, we have suggested in prior research that we think the price already reflects the expectation of negative revisions for 2016 and that sentiment driven weakness provides for an interesting entry point. Notwithstanding the emotional gyrations caused by the swings in oil prices, we think that the entry point is now. Synergies – likely a lot more than WLK is suggesting – perhaps as much as $200 million. All this suggests that WLK could pay a lot more for AXLL (probably 50% more than offered before the opportunity might begin to look more marginal). The question is whether it will need to. If AXLL can find a “white knight” it is almost inevitable that WLK will increase its bid – which of course makes it harder for AXLL to find a “white knight”. It will be interesting to see how this plays out, but if WLK can get AXLL at or around the current asking price we would be buyers of the stock today and on any further revision related weakness. WLK has screened as the most attractive small/midcap stock in our multifactor selection model for most of the last year. Aside from the AXLL deal, WLK is very inexpensive, and likely already discounts more of a reduction in 2016 EBITDA than is likely. WLK has the lowest EV/EBITDA value in the group today – Exhibit 1 – and if you assume that the share price is discounting a move to the average of the commodity group, then it is discounting a 20% decline in 2016 EBITDA versus current consensus. 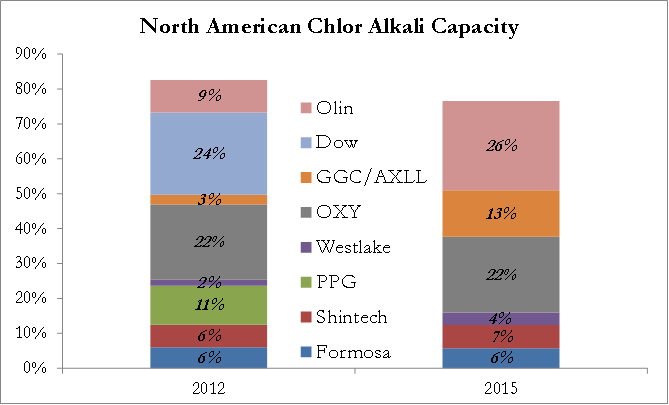 A Westlake/Axiall combination would be the next in a series of consolidating moves in the North American chlor alkali market that started with AXLL itself (still Georgia Gulf then) acquiring PPG’s business. As industry leaders, DOW and now OLN have reduced capacity in an oversupplied market, giving the same major players a slightly smaller share of the overall capacity pie, but concentrated in fewer hands thus increasing a simple, sum of squared market shares, HHI. Given the very global nature of both PVC and caustic soda we do not believe that an AXLL/WLK combination would hit any serious regulatory hurdles. 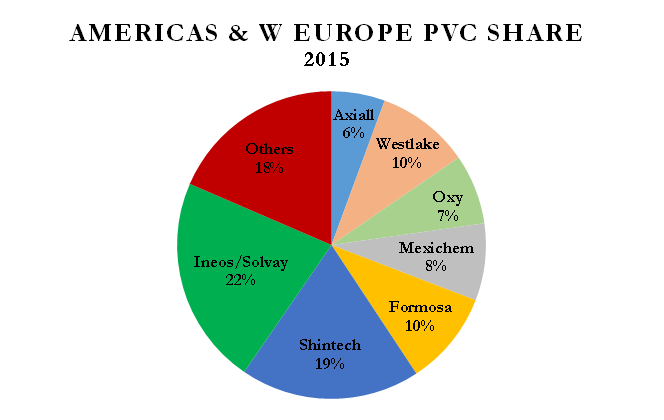 The combined AXLL-WLK entity would have a similar competitive position in PVC as in chlor alkali, when we look at a combination of the Americas and West European market. Globally the market remains very fragmented with dozens of producers – many of them new – in Asia. A deal would bulk up the downstream portfolio and provide an answer for AXLL in reviewing its Building Products business as WLK would likely want to keep the businesses and combine with its own downstream business, which is dominated by pipe. AXLL’s joint venture with Lotte gives the company substantial flexibility from an ethylene perspective, with the option to escalate its ownership percentage from 10% to 50% and the right of first refusal for any excess ethylene not consumed by Lotte itself. WLK has opted for capacity expansions rather than greenfield projects – acquiring AXLL would be a low risk way to participate here. Further optionality and additional ethylene could come from EMN – with the increased ethylene need from AXLL, WLK would become the most logical buyer of EMN’s excess ethylene capacity. 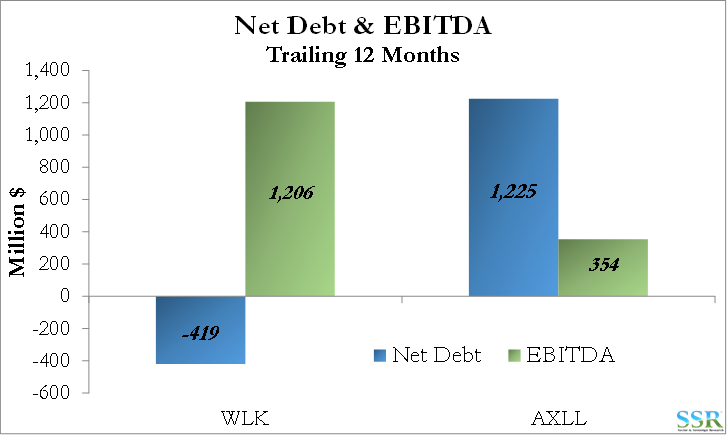 From a capital structure perspective this is a good match – WLK’s net cash balance puts it in position to assume AXLL’s debt and AXLL will not hamstring its acquirer with its obligations – Exhibit 4. The implied pro forma net debt to EBITDA ratio (assuming no synergies) is 0.5 on a trailing basis, which would be the lowest in the Chemical space. By virtue of receiving roughly .2 WLK shares for every share of AXLL owned, shareholders would gain potential upside in a company that trades at a lower EV/EBITDA multiple and has arguably a better business model. 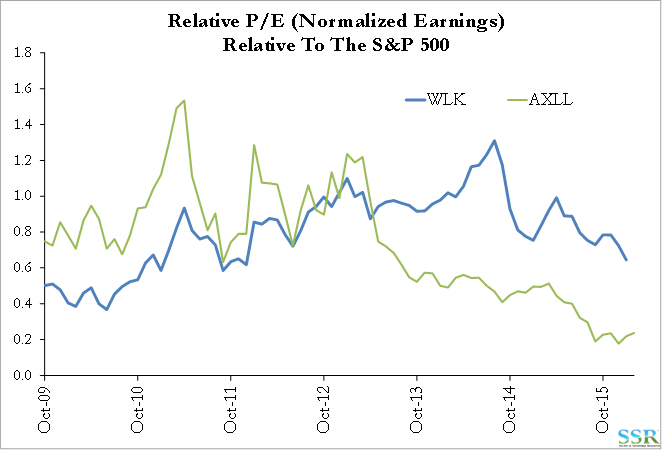 The market, at least, has placed more value on a dollar of WLK earnings compared to AXLL, particularly over the past three years – Exhibit 5. 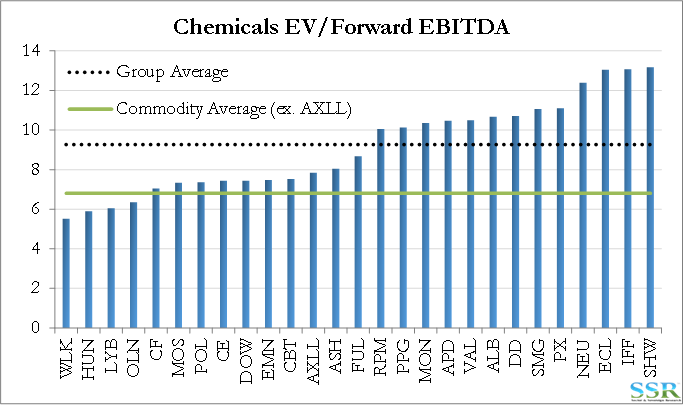 We noted in Exhibit 1 that WLK has the lowest EBITDA multiple in our Chemicals group. Current estimates would have to fall 20% to equate WLK’s multiple with the commodity group average. 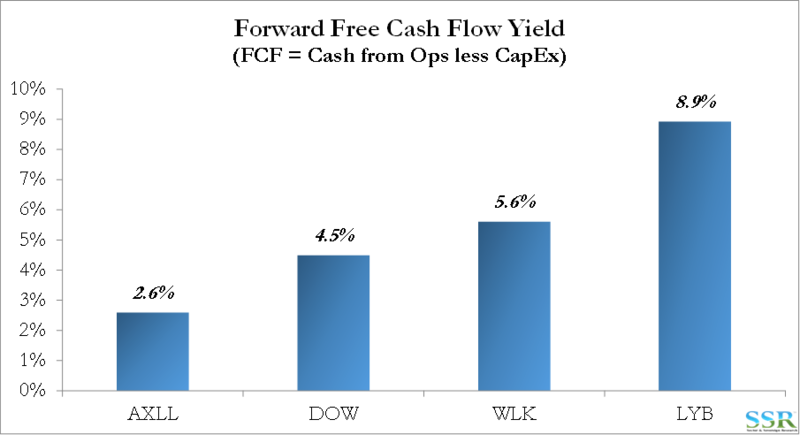 On a free cash flow basis, WLK does not look as strong as LYB but compares favorably otherwise – Exhibit 6. The major risk here is that polyethylene margins deteriorate further and/or quicker than we already anticipate – see recent research. The emergence of a second bidder would also present a risk, as WLK might be inclined to pay up, but we do not see this as likely – we ran through several possible scenarios in a recent note.